You will receive information on the development and roadmap of PrtScr Assistant project, notifications about every new release and instructions on how to get it. Click on the link below to join PrtScr Assistant mailing list! 10.09.13. The new version PrtScr Assistant 1.3.0.63 released. 15.07.13. The new version PrtScr Assistant 1.2.7.53 released. 02.05.13. The new version PrtScr Assistant 1.2.6.48 released. 20.04.13. The new version PrtScr Assistant 1.2.5.42 released. 18.04.13. The new version PrtScr Assistant 1.2.4.40 released. 05.04.13. The new version PrtScr Assistant 1.2.3.38 released. 31.03.13. The new version PrtScr Assistant 1.2.2.33 released. 31.08.12. The new version PrtScr Assistant 1.2.1.25 released. 21.03.12. The new version PrtScr Assistant 1.1.1.24 released. 27.04.09. The first public version PrtScr Assistant 1.0.0.18 released. PrtScr Assistant - a quick, simple, flexible desktop tool that allows users to capture the screen in either full, rectangle or window mode to clipboard or file. Free to use. The program is designed for capture the user copies the screen by pressing hotkeys. The program is designed to run on Windows 2000, XP, Vista, 2008, 7, Server 2008 R2, 8, Server 8 (x86/x64). You use the program "as is", at your own risk. 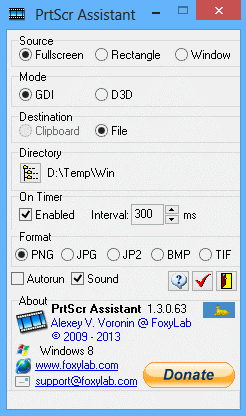 PrtScr Assistant is distributed under CC BY-ND 3.0 license ("Attribution-NoDerivs"). When user run the installation file "PrtScrAssistant_Setup.exe" the user selects the interface language of the installer (language of the program only English), then the installation program files in the folder "%PROGRAMFILES%\Alexey V. Voronin\PrtScr_Assistant", create shortcuts in the folder "Alexey V. Voronin\PrtScr Assistant" of menu "Start". An icon of the desktop can be created, program can be started after the end of the installation and the site can be opened in a browser with the agreement of the user. When you run the program is displayed as icons in the tray. When you click the left mouse button on the icon (or using the popup menu "Restore", displayed when clicking the right mouse button on the icon in the tray) unfolding program window. on/off automatically run program when Windows starts ("Autorun"). When you right-click on the icon pop-up menu appears. Through this menu can be set to copy the source and destination, on/off timer copy, minimized ("Minimize") and restored ("Restore") program window, and also carried out the program ("Exit"). When you copy a rectangular area the user must click the left mouse button, select the screen area of the frame copy and release the left button. This will happen immediately copying or copying is activated periodically by timer. When you copy a window the user should not pressing the mouse button, move the cursor into the copied window (with the currently selected window highlighted red frame), and click the left mouse button. This will happen immediately copying or copying is activated periodically by timer (when you select the capture timer mode is automatically activated to save the file). Name stored image file is created automatically and has the form "yymmddhhnnsszzz.png" or "yymmddhhnnsszzz.jpg", where yy - year, mm - month, dd - day, hh - hour, nn - minutes, ss - seconds, zzz - milliseconds of moment to save the file. By default, the program saves image files in a directory in which it is running. To select another folder, click in the program window. In doing so, the name of the selected folder is displayed next to the button . When you click on the button or in the title window program rolled in the system tray. The exit occurs on the command "Exit" context menu when right-click on the icon in the tray or click on the button in the program window. Program settings are stored in the ini-file PrtScrAssistant.ini in the folder used for apllications data (in Windows XP is C:\Documents and Settings\%UserName%\Application Data, in Windows Vista and later - C:\Users\%UserName%\AppData\Roaming), when you exit the program or pressing the button in the program window. displayed version of the program, information about the authorship of the program, operating system. When you click the Internet address of the home page program ("Homepage") it is opening in the browser, Clicking on an e-mail address ("Support E-Mail") opens the mail client for email.